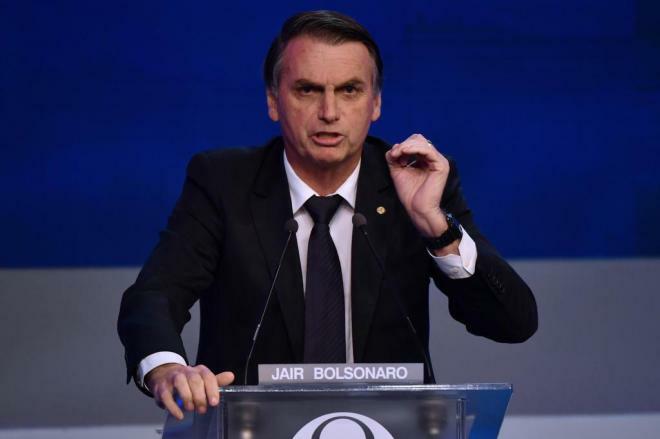 Bolsonaro, who openly admires Brazil’s former military dictatorship and shocked many with his derogatory remarks on women, gays and blacks, won 55 percent of the vote in a run-off election Sunday – more than 10 points ahead of leftist opponent Fernando Haddad. “We will change Brazil’s destiny together,” he said in his victory speech – broadcast live from his home on Facebook, the platform he has used to campaign since an attacker stabbed him in the stomach at a rally on September 6. Bolsonaro’s victory has left international observers frightened for the future of Brazilian democracy. Brazil was ruled by a brutal military dictatorship known for mass extra-judicial killings until 1985. In 1999, Bolsonaro spoke nostalgically about the days of the dictatorship during a television appearance. “Through the vote, you won’t change anything in this country. Absolutely nothing. It’s only going to change, unfortunately, when we get to a Civil War and do the job the military didn’t do, killing 30,000,” he said. Late in the campaign, Bolsonaro vowed to “cleanse” Brazil of leftist “reds,” and threatened to jail Haddad along with beloved former president Lula da Silva, who was imprisoned this year on charges of corruption. Haddad, a former Sao Paulo mayor, said he would fight to “defend the freedoms of those 45 million people” who voted for him. Supporters of Haddad and the Workers’ Party reacted to Bolsonaro’s win with despair. “Fascists!” shouted tearful supporters at the headquarters of Haddad’s Workers’ Party in Sao Paulo. “I’m surprised Brazilians would vote for hate, for guns,” said Flavia Castelhanos, 31, after wiping away her tears, wearing a pin that said “Not him” – opponents’ rallying cry against Bolsonaro. One of Bolsonaro’s top advisers, economic guru Paulo Guedes, promised Sunday night that the new administration’s economic reforms will be sweeping. “We are going to change the social-democratic economic model. It’s terrible,” said Guedes, a liberal economist trained at the University of Chicago who will head an economy super-ministry under Bolsonaro. Bolsonaro is champion of agribusiness and his economic platform has left many fearing for the future of the Amazon, known as “the lungs of the planet”. He promised to merge Brazil’s agriculture and environment ministries into one, cutting environmental regulations. “It’s all about downsizing government and getting it out of the way so investors and big agribusiness landowners and companies can come in and have a freer hand for more trashing of resources and indigenous rights,” Victor Menotti, a former director of the International Forum on Globalization, told AFP. But an even larger portion of voters rejected Haddad and the tarnished legacy of the Workers’ Party, which had won the past four presidential elections. The polls came on the heels of Brazil’s worst-ever recession, a staggering multi-billion-dollar corruption scandal and a year of record-setting violent crime. Haddad stood as a surrogate for the popular but imprisoned Lula, who led Brazil through the boom years of 2003 to 2010, before both the country and his left-wing political project went bust. The former president claims the charges against him are politically motivated, and polls showed that if he had been allowed to run from prison, he likely would have won the presidency. Center-right President Michel Temer, who is set to leave office as the most unpopular leader in Brazil’s modern democracy, congratulated Bolsonaro and said the transition process would start Monday.